ranslation used: M. H. Shakir, published by Tahrike Tarsile Qur’an, Inc., 1983, unless otherwise indicated. 002:178-179: [2.178] …retaliation is prescribed for you in the matter of the slain… [2.179] …there is life for you in (the law of) retaliation, O men of understanding, that you may guard yourselves. 002:190-191: [2.190] …fight in the way of Allah with those who fight with you…[2.191] And kill them wherever you find them, and drive them out from whence they drove you out, and persecution is severer than slaughter, and do not fight with them at the Sacred Mosque until they fight with you in it, but if they do fight you, then slay them; such is the recompense of the unbelievers. 003:121-125: [3.121]…to lodge the believers in encampments for war…[3.123]…Allah did certainly assist you at [the Battle of] Badr…[3.124]…[3.125] Yea! if you remain patient and are on your guard, and they come upon you in a headlong manner, your Lord will assist you with five thousand of the havoc-making angels. 003:195: …who fought and were slain…I will most certainly make them enter gardens beneath which rivers flow; a reward from Allah, and with Allah is yet better reward. 004:071-072: [4.71] …go forth in detachments or go forth in a body [to war]. 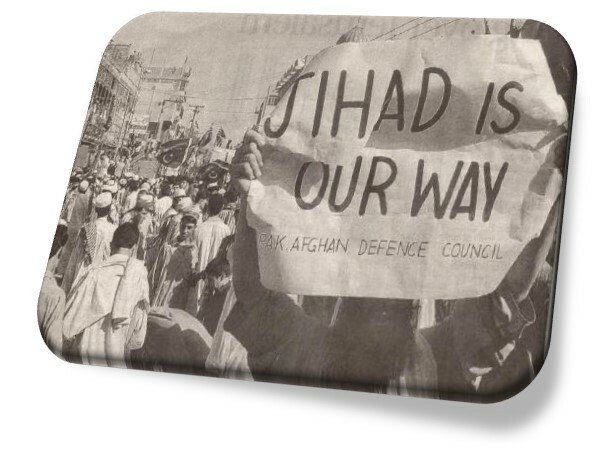 [4.72] …hang back [from Jihad] …not present with them [in Jihad]. 005:035: …strive hard [at Jihad] in His way that you may be successful. 008:009: …I will assist you [in Jihad] with a thousand of the angels following one another [see 008:012]. 008:012: …make firm those who believe. I will cast terror into the hearts of those who disbelieve. Therefore strike off their heads and strike off every fingertip of them. 008:065: O Prophet! urge the believers to war; if there are twenty patient ones of you they shall overcome two hundred, and if there are a hundred of you they shall overcome a thousand of those who disbelieve, because they are a people who do not understand [in other words, do not understand totalitarian ideologies like Islam]. 009:012-014: [9.12] …fight the leaders of unbelief…[9.13] What! will you not fight a people…[9.14] Fight them, Allah will punish them by your hands and bring them to disgrace, and assist you against them and heal the hearts of a believing people. 009:029: Fight those who do not believe in Allah…nor follow the religion of truth, out of those who have been given the Book, until they pay the tax in acknowledgment of superiority and they are in a state of subjection. 009:092: YUSUFALI: Nor (is there blame) on those who came to thee to be provided with mounts [saddles on which to go to war], and when thou said, “I can find no mounts for you,” they turned back, their eyes streaming with tears of grief that they had no resources wherewith to provide the expenses [to go on Jihad]. 033:020: …they would not fight save a little [in Jihad]. 033:025-026: [33.25] …Allah sufficed the believers in fighting… [33.26] …some [Jews] you killed and you took captive another part. 061:004: …Allah loves those who fight in His way in ranks as if they were a firm and compact wall. Translation used: M. H. Shakir, published by Tahrike Tarsile Qur’an, Inc., 1983, unless otherwise indicated. 002:178-179: [2.178] O you who believe! retaliation is prescribed for you in the matter of the slain, the free for the free, and the slave for the slave, and the female for the female, but if any remission is made to any one by his (aggrieved) brother, then prosecution (for the bloodwit) should be made according to usage, and payment should be made to him in a good manner; this is an alleviation from your Lord and a mercy; so whoever exceeds the limit after this he shall have a painful chastisement. [2.179] And there is life for you in (the law of) retaliation, O men of understanding, that you may guard yourselves. 002:190-191: [2.190] And fight in the way of Allah with those who fight with you, and do not exceed the limits, surely Allah does not love those who exceed the limits. [2.191] And kill them wherever you find them, and drive them out from whence they drove you out, and persecution is severer than slaughter, and do not fight with them at the Sacred Mosque until they fight with you in it, but if they do fight you, then slay them; such is the recompense of the unbelievers. 002:193: And fight with them until there is no persecution, and religion should be only for Allah, but if they desist, then there should be no hostility except against the oppressors. 002:216-218: [2.216] Fighting is enjoined on you, and it is an object of dislike to you; and it may be that you dislike a thing while it is good for you, and it may be that you love a thing while it is evil for you, and Allah knows, while you do not know. [2.217] They ask you concerning the sacred month about fighting in it. Say: Fighting in it is a grave matter, and hindering (men) from Allah’s way and denying Him, and (hindering men from) the Sacred Mosque and turning its people out of it, are still graver with Allah, and persecution is graver than slaughter; and they will not cease fighting with you until they turn you back from your religion, if they can; and whoever of you turns back from his religion, then he dies while an unbeliever– these it is whose works shall go for nothing in this world and the hereafter, and they are the inmates of the fire; therein they shall abide. [2.218] Surely those who believed and those who fled (their home) and strove hard in the way of Allah these hope for the mercy of Allah and Allah is Forgiving, Merciful. 002:244: And fight in the way of Allah, and know that Allah is Hearing, Knowing. 003:121-125: [3.121] And when you did go forth early in the morning from your family to lodge the believers in encampments for war and Allah is Hearing, Knowing. [3.122] When two parties from among you had determined that they should show cowardice, and Allah was the guardian of them both, and in Allah should the believers trust. [3.123] And Allah did certainly assist you at [the Battle of] Badr when you were weak; be careful of (your duty to) Allah then, that you may give thanks. [3.124] When you said to the believers: Does it not suffice you that your Lord should assist you with three thousand of the angels sent down? [3.125] Yea! if you remain patient and are on your guard, and they come upon you in a headlong manner, your Lord will assist you with five thousand of the havoc-making angels. 003:140: If a wound has afflicted you (at [the Battle of] Uhud), a wound like it has also afflicted the (unbelieving) people; and We bring these days to men by turns, and that Allah may know those who believe and take witnesses from among you; and Allah does not love the unjust. 003:155-156: [3.155] (As for) those of you who turned back on the day when the two armies met, only the Satan sought to cause them to make a slip on account of some deeds they had done, and certainly Allah has pardoned them; surely Allah is Forgiving, Forbearing. [3.156] O you who believe! be not like those who disbelieve and say of their brethren when they travel in the earth or engage in fighting: Had they been with us, they would not have died and they would not have been slain; so Allah makes this to be an intense regret in their hearts; and Allah gives life and causes death and Allah sees what you do. 003:165-167: [3.165] What! when a misfortune befell you, and you had certainly afflicted (the unbelievers) with twice as much [with Jihad], you began to say: Whence is this? Say: It is from yourselves; surely Allah has power over all things. [3.166] And what befell you on the day when the two armies met ([the Battle of] Uhud) was with Allah’s knowledge, and that He might know the believers. [3.167] And that He might know the hypocrites; and it was said to them: Come, fight in Allah’s way, or defend yourselves. They said: If we knew fighting, we would certainly have followed you. They were on that day much nearer to unbelief than to belief. They say with their mouths what is not in their hearts, and Allah best knows what they conceal. 003:173: Those to whom the people said: Surely men have gathered against you [in battle], therefore fear them, but this increased their faith, and they said: Allah is sufficient for us and most excellent is the Protector. 003:195: So their Lord accepted their prayer: That I will not waste the work of a worker among you, whether male or female, the one of you being from the other; they, therefore, who fled and were turned out of their homes and persecuted in My way and who fought and were slain, I will most certainly cover their evil deeds, and I will most certainly make them enter gardens beneath which rivers flow; a reward from Allah, and with Allah is yet better reward. 004:071-072: [4.71] O you who believe! take your precaution, then go forth in detachments or go forth in a body [to war]. [4.72] And surely among you is he who would certainly hang back [from Jihad]! If then a misfortune befalls you he says: Surely Allah conferred a benefit on me that I was not present with them [in Jihad]. 004:074-077: [4.74] Therefore let those fight in the way of Allah, who sell this world’s life for the hereafter; and whoever fights in the way of Allah, then be he slain or be he victorious, We shall grant him a mighty reward. [4.75] And what reason have you that you should not fight in the way of Allah and of the weak among the men and the women and the children, (of) those who say: Our Lord! cause us to go forth from this town, whose people are oppressors, and give us from Thee a guardian and give us from Thee a helper. [4.76] Those who believe fight in the way of Allah, and those who disbelieve fight in the way of the Satan. Fight therefore against the friends of the Satan; surely the strategy of the Satan is weak. [4.77] Have you not seen those to whom it was said: Withhold your hands, and keep up prayer and pay the poor-rate; but when fighting is prescribed for them, lo! a party of them fear men as they ought to have feared Allah, or (even) with a greater fear, and say: Our Lord! why hast Thou ordained fighting for us? Wherefore didst Thou not grant us a delay to a near end? Say: The provision of this world is short, and the hereafter is better for him who guards (against evil); and you shall not be wronged the husk of a date stone. 004:084: Fight then in Allah’s way; this is not imposed on you except in relation to yourself, and rouse the believers to ardor maybe Allah will restrain the fighting of those who disbelieve and Allah is strongest in prowess and strongest to give an exemplary punishment. 004:089: They desire that you should disbelieve as they have disbelieved, so that you might be (all) alike; therefore take not from among them friends until they fly (their homes) in Allah’s way; but if they turn back [to their homes], then seize them and kill them wherever you find them, and take not from among them a friend or a helper. 004:091: You will find others who desire that they should be safe from you and secure from their own people; as often as they are sent back to the mischief they get thrown into it headlong; therefore if they do not withdraw from you, and (do not) offer you peace and restrain their hands, then seize them and kill them wherever you find them; and against these We have given you a clear authority. 004:100: And whoever flies in Allah’s way [forsakes his home to fight in Jihad], he will find in the earth many a place of refuge and abundant resources, and whoever goes forth from his house flying to Allah and His Apostle, and then death overtakes him [in Jihad], his reward is indeed with Allah and Allah is Forgiving, Merciful. 004:102: And when you are among them and keep up the prayer for them, let a party of them stand up with you, and let them take their arms; then when they have prostrated themselves let them go to your rear, and let another party who have not prayed come forward and pray with you, and let them take their precautions and their arms; (for) those who disbelieve desire that you may be careless of your arms and your luggage, so that they may then turn upon you with a sudden united attack, and there is no blame on you, if you are annoyed with rain or if you are sick, that you lay down your arms, and take your precautions; surely Allah has prepared a disgraceful chastisement for the unbelievers. 005:035: O you who believe! be careful of (your duty to) Allah and seek means of nearness to Him and strive hard [at Jihad] in His way that you may be successful. 008:009: When you sought aid from your Lord [at the Battle of Badr], so He answered you: I will assist you [in Jihad] with a thousand of the angels following one another [see 008:012]. 008:012: When your Lord revealed to the angels: I am with you, therefore make firm those who believe. I will cast terror into the hearts of those who disbelieve. Therefore strike off their heads and strike off every fingertip of them. 008:015-017: [8.15] O you who believe! when you meet those who disbelieve marching for war, then turn not your backs to them. [8.16] And whoever shall turn his back to them on that day—unless he turn aside for the sake of fighting or withdraws to a company– then he, indeed, becomes deserving of Allah’s wrath, and his abode is hell; and an evil destination shall it be. [8.17] So you did not slay them, but it was Allah Who slew them, and you did not smite when you smote (the enemy), but it was Allah Who smote [Allah gets the credit for Jihad], and that He might confer upon the believers a good gift from Himself; surely Allah is Hearing, Knowing. 008:039: And fight with them until there is no more persecution and religion should be only for Allah; but if they desist, then surely Allah sees what they do. 008:045: O you who believe! when you meet a party [in battle], then be firm, and remember Allah much, that you may be successful. 008:059-060: [8.59] And let not those who disbelieve think that they shall come in first; surely they will not escape. [8.60] And prepare against them what force you can and horses tied at the frontier, to frighten thereby the enemy of Allah and your enemy and others besides them, whom you do not know (but) Allah knows them; and whatever thing you will spend in Allah’s way [for Jihad], it will be paid back to you fully and you shall not be dealt with unjustly. 008:067: It is not fit for a prophet that he should take captives unless he has fought and triumphed in the land; you desire the frail goods of this world [i.e., ransom money], while Allah desires (for you) the hereafter; and Allah is Mighty, Wise. 008:069: Eat then of the lawful and good (things) which you have acquired in war, and be careful of (your duty to) Allah; surely Allah is Forgiving, Merciful. 008:071-072: [8.71] And if they intend to act unfaithfully towards you, so indeed they acted unfaithfully towards Allah before, but He gave (you) mastery over them; and Allah is Knowing, Wise. [8.72] Surely those who believed and fled (their homes) and struggled hard in Allah’s way with their property and their souls [in Jihad], and those who gave shelter and helped [harbored terrorists]– these are guardians of each other; and (as for) those who believed and did not fly, not yours is their guardianship until they fly; and if they seek aid from you in the matter of religion [Jihad against people without a treaty—see next phrase], aid is incumbent on you except against a people between whom and you there is a treaty, and Allah sees what you do. 008:074-075: [8.74] And (as for) those who believed and fled and struggled hard in Allah’s way [Jihad], and those who gave shelter and helped [harbored terrorists], these are the believers truly; they shall have forgiveness and honorable provision. [8.75] And (as for) those who believed afterwards and fled and struggled hard [Jihad] along with you, they are of you; and the possessors of relationships are nearer to each other in the ordinance of Allah [terrorists have a close relationship with those who harbor them]; surely Allah knows all things. 009:005: So when the sacred months have passed away, then slay the idolaters wherever you find them, and take them captives and besiege them and lie in wait for them in every ambush, then if they repent and keep up prayer and pay the poor-rate, leave their way free to them; surely Allah is Forgiving, Merciful. 009:012-014: [9.12] And if they break their oaths after their agreement and (openly) revile your religion, then fight the leaders of unbelief— surely their oaths are nothing– so that they may desist. [9.13] What! will you not fight a people who broke their oaths and aimed at the expulsion of the Apostle, and they attacked you first; do you fear them? But Allah is most deserving that you should fear Him, if you are believers. [9.14] Fight them, Allah will punish them by your hands and bring them to disgrace, and assist you against them and heal the hearts of a believing people. 009:016: What! do you think that you will be left alone while Allah has not yet known those of you who have struggled hard [Jihad] and have not taken any one as an adherent besides Allah and His Apostle and the believers; and Allah is aware of what you do. 009:019-020: [9.19] What! do you make (one who undertakes) the giving of drink to the pilgrims and the guarding of the Sacred Mosque like him who believes in Allah and the latter day and strives hard in Allah’s way [Jihad]? They are not equal with Allah; and Allah does not guide the unjust people. [9.20] Those who believed and fled (their homes), and strove hard [Jihad] in Allah’s way with their property and their souls, are much higher in rank with Allah; and those are they who are the achievers (of their objects). 009:024-026: [9.24] Say: If your fathers and your sons and your brethren and your mates and your kinsfolk and property which you have acquired, and the slackness of trade which you fear and dwellings which you like, are dearer to you than Allah and His Apostle and striving in His way [Jihad]:, then wait till Allah brings about His command [to go on Jihad]: and Allah does not guide the transgressing people. [9.25] Certainly Allah helped you in many battlefields and on the day of [the Battle of] Hunain, when your great numbers made you vain, but they availed you nothing and the earth became strait to you notwithstanding its spaciousness, then you turned back retreating. [9.26] Then Allah sent down His tranquility upon His Apostle and upon the believers, and sent down hosts which you did not see, and chastised those who disbelieved [Muhammad gives credit to angels and Allah for the actions of Jihadists], and that is the reward of the unbelievers. 009:029: Fight those who do not believe in Allah, nor in the latter day, nor do they prohibit what Allah and His Apostle have prohibited, nor follow the religion of truth, out of those who have been given the Book, until they pay the tax in acknowledgment of superiority and they are in a state of subjection. 009:036: Surely the number of months with Allah is twelve months in Allah’s ordinance since the day when He created the heavens and the earth, of these four being sacred; that is the right reckoning; therefore be not unjust to yourselves regarding them, and fight the polytheists all together as they fight you all together; and know that Allah is with those who guard (against evil). 009:038-039: [9.38] O you who believe! What (excuse) have you that when it is said to you: Go forth in Allah’s way [to Jihad], you should incline heavily to earth; are you contented with this world’s life instead of the hereafter? But the provision of this world’s life compared with the hereafter is but little. [9.38] If you do not go forth [to go on Jihad], He will chastise you with a painful chastisement and bring in your place a people other than you [to go on Jihad], and you will do Him no harm; and Allah has power over all things. 009:041: Go forth lightly [lightly armed] and heavy [heavily armed], and strive hard in Allah’s way [Jihad] with your property and your persons; this is better for you, if you know. 009:044: They do not ask leave of you who believe in Allah and the latter day (to stay away) from striving hard with their property and their persons [Jihad], and Allah knows those who guard (against evil). 009:052: Say: Do you await for us but one of two most excellent things? And we await for you that Allah will afflict you with punishment from Himself or by our hands. So wait; we too will wait with you. 009:073: O Prophet! strive hard [Jihad] against the unbelievers and the hypocrites and be unyielding to them; and their abode is hell, and evil is the destination. 009:081: Those who were left behind were glad on account of their sitting behind Allah’s Apostle and they were averse from striving m Allah’s way [Jihad] with their property and their persons, and said: Do not go forth [to Jihad] in the heat. Say: The fire of hell is much severe in heat. Would that they understood (it). 009:083: Therefore if Allah brings you back to a party of them and then they ask your permission to go forth, say: By no means shall you ever go forth with me and by no means shall you fight an enemy with me [in Jihad]; surely you chose to sit the first time, therefore sit (now) with those who remain behind. 009:086: And whenever a chapter is revealed, saying: Believe in Allah and strive hard [in Jihad] along with His Apostle, those having ampleness of means ask permission of you and say: Leave us (behind), that we may be with those who sit. 009:088: But the Apostle and those who believe with him strive hard [in Jihad] with their property and their persons; and these it is who shall have the good things and these it is who shall be successful. 009:111: Surely Allah has bought of the believers their persons and their property for this, that they shall have the garden; they fight in Allah’s way, so they slay and are slain; a promise which is binding on Him in the Taurat and the Injeel and the Quran; and who is more faithful to his covenant than Allah? Rejoice therefore in the pledge which you have made; and that is the mighty achievement. 009:122-123: [9.122] PICKTHAL: And the believers should not all go out to fight. Of every troop of them, a party only should go forth, that they (who are left behind) may gain sound knowledge in religion, and that they may warn their folk when they return to them, so that they may beware. [9.123] O you who believe! fight those of the unbelievers who are near to you and let them find in you hardness; and know that Allah is with those who guard (against evil). 016:110: YUSUFALI: But verily thy Lord,- to those who leave their homes after trials and persecutions,- and who thereafter strive and fight for the faith and patiently persevere,- Thy Lord, after all this is oft-forgiving, Most Merciful. 022:078: And strive hard [in Jihad] in (the way of) Allah, (such) a striving a is due to Him; He has chosen you and has not laid upon you a hardship in religion; the faith of your father Ibrahim; He named you Muslims before and in this, that the Messenger may be a bearer of witness to you, and you may be bearers of witness to the people; therefore keep up prayer and pay the poor-rate and hold fast by Allah; He is your Guardian; how excellent the Guardian and how excellent the Helper! 029:006: And whoever strives hard [in Jihad], he strives only for his own soul; most surely Allah is Self-sufficient, above (need of) the worlds. 029:069: And (as for) those who strive hard [in Jihad] for Us, We will most certainly guide them in Our ways; and Allah is most surely with the doers of good. 033:015: PICKTHAL: And verily they had already sworn unto Allah that they would not turn their backs (to the foe) [in Jihad battle]. An oath to Allah must be answered for. 033:020: They think the allies are not gone, and if the allies should come (again) they would fain [gladly] be in the deserts with the desert Arabs asking for news about you, and if they were among you they would not fight save a little [in Jihad]. 033:025-026: [33.25] And Allah turned back the unbelievers in their rage; they did not obtain any advantage, and Allah sufficed the believers in fighting; and Allah is Strong, Mighty. [33.26] And He drove down those of the followers of the Book who backed them from their fortresses and He cast awe into their hearts; some [Jews] you killed and you took captive another part. 047:020: And those who believe say: Why has not a chapter been revealed? But when a decisive chapter is revealed, and fighting [allusion to Jihad] is mentioned therein you see those in whose hearts is a disease look to you with the look of one fainting because of death. Woe to them then! 048:016: Say to those of the dwellers of the desert [the Bedouin] who were left behind: You shall soon be invited (to fight) against a people possessing mighty prowess; you will fight against them until they submit; then if you obey, Allah will grant you a good reward [booty]; and if you turn back as you turned back before, He will punish you with a painful punishment. 048:022: And if those who disbelieve fight with you, they would certainly turn (their) backs, then they would not find any protector or a helper. 059:002: He it is Who caused those who disbelieved of the followers of the Book to go forth from their homes at the first banishment you did not think that they would go forth, while they were certain that their fortresses would defend them against Allah; but Allah came to them whence they did not expect, and cast terror into their hearts; they demolished their houses with their own hands and the hands of the believers [i. e. Muslims demolished Jewish homes]; therefore take a lesson, O you who have eyes! 059:005-008: [59.5] Whatever palm-tree you cut down or leave standing upon its roots [during a Jihad siege], It is by Allah’s command, and that He may abase the transgressors. [59.6] And whatever Allah restored to His Apostle from them you did not press forward against it any horse or a riding camel but Allah gives authority to His apostles against whom He pleases, and Allah has power over all things. [59.7] Whatever Allah has restored to His Apostle from the people of the towns [booty], it is for Allah and for the Apostle, and for the near of kin and the orphans and the needy and the wayfarer, so that it may not be a thing taken by turns among the rich of you, and whatever the Apostle gives you, accept it, and from whatever he forbids you, keep back, and be careful of (your duty to) Allah; surely Allah is severe in retributing (evil): [59.8] (It is) for the poor who fled their homes and their possessions, seeking grace of Allah and (His) pleasure, and assisting Allah and His Apostle [booty]: these it is that are the truthful. 059:014: They will not fight against you in a body save in fortified towns or from behind walls; their fighting between them is severe, you may think them as one body, and their hearts are disunited; that is because they are a people who have no sense. 060:009: Allah only forbids you respecting those who made war upon you on account of (your) religion [i.e., no fraternizing with the enemy], and drove you forth from your homes and backed up (others) in your expulsion, that you make friends with them, and whoever makes friends with them, these are the unjust. 061:004: Surely Allah loves those who fight in His way in ranks as if they were a firm and compact wall. 064:014: O you who believe! surely from among your wives and your children there is an enemy to you; therefore beware of them [collaborators with the enemy, especially if the women were once war spoils]; and if you pardon and forbear and forgive, then surely Allah is Forgiving, Merciful. 066:009: O Prophet! strive hard against the unbelievers and the hypocrites, and be hard against them; and their abode is hell; and evil is the resort. 073:020: Surely your Lord knows that you pass in prayer nearly two-thirds of the night, and (sometimes) half of it, and (sometimes) a third of it, and (also) a party of those with you; and Allah measures the night and the day. He knows that you are not able to do it, so He has turned to you (mercifully), therefore read what is easy of the Quran. He knows that there must be among you sick, and others who travel in the land seeking of the bounty of Allah, and others who fight in Allah’s way, therefore read as much of it as is easy (to you), and keep up prayer and pay the poor-rate and offer to Allah a goodly gift, and whatever of good you send on beforehand for yourselves, you will find it with Allah; that is best and greatest in reward; and ask forgiveness of Allah; surely Allah is Forgiving, Merciful. Jihad can be terrorism as it can be any type of struggle. The problem is with ‘jihadis’ who adhere to extremist views, it becomes terrorism.